We won’t be listing down the pains that come with Chinese New Year because 1) public holidays (and here’s how you should plan them) and 2) #angbaohaul but if we had to nail at least three down, they’d be : inquisitive relatives, putting up brave fronts and the planning of family meals at restaurants that are open during the period. 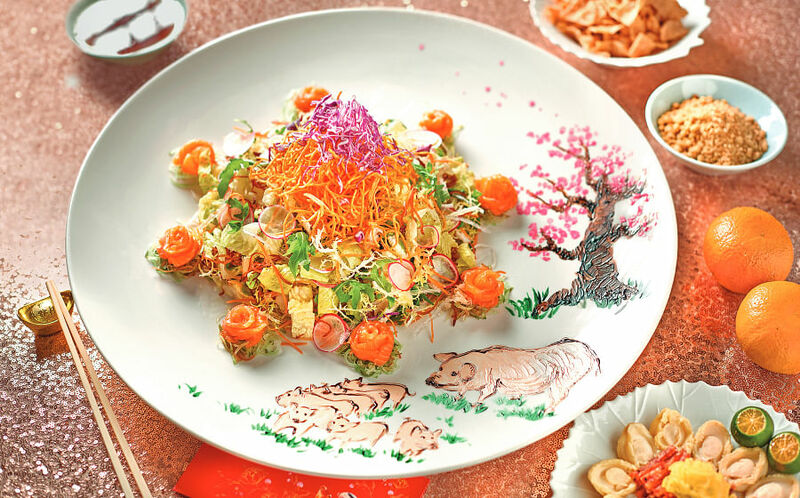 Thankfully, Goodwood Park Hotel is here to solve the latter with their Lunar New Year menu that’s available at Min Jiang, a restaurant within the hotel and One-North (No.5 Rochester Park). Pictured above: The Chinese New Year stalwart now comes with an illustration of eight pigs enjoying a stroll that’s personally painted by Master Chef Chan Hwan Kee of Min Jiang. If that isn’t enough to wow you, the unconventional ingredients might: bak kwa, wild arugula, red sorrels, fried sweet potatoes and a homemade dressing of calamansi juice, plum sauce, lemongrass and strawberry jam. $168++ for a large portion only (dine-in only). 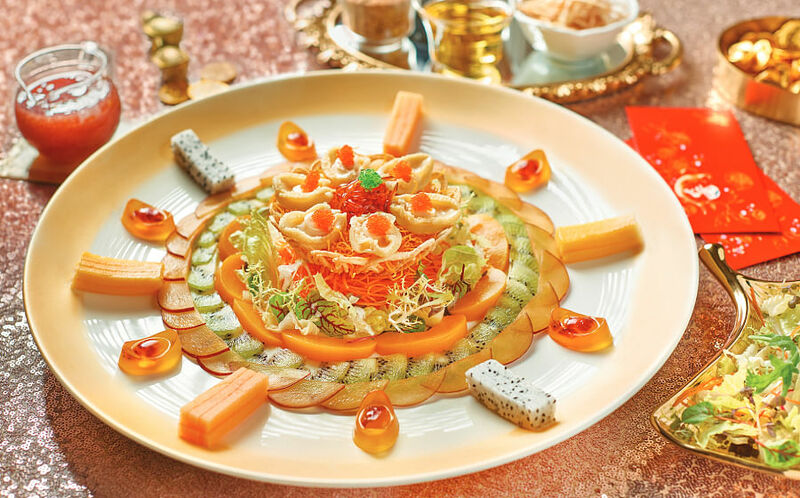 The Fruitful Abundance Yu Sheng with Whole Abalone in Raspberry and Sour Plum Sauce available at Min Jiang at One-North may sound like a mouthful but that’s exactly what it is: tropical fruits, ingot -shaped yuzu jelly and six baby abalones topped with red tobiko are just some of the ingredients featured. $118++ for a small portion and $168++ for a larger one (dine-in only). If Goodwood Park Hotel does confectionery, they’re really going to do confectionery. 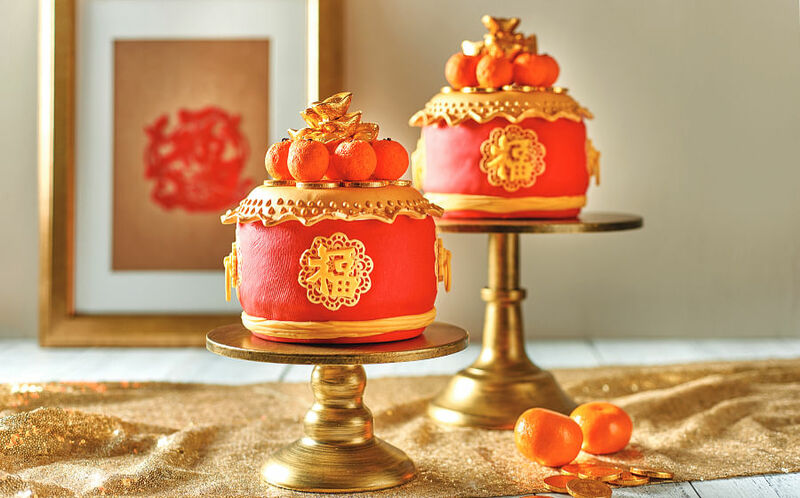 The Drum of Fortune cake weighs in at a whopping 1.3kg and is a chocolate marble one that’s coated with fondant, and topped with eight mandarin oranges and mini chocolate ingots. It’s available for takeaway at The Deli @ Goodwood Park Hotel. $108 nett. 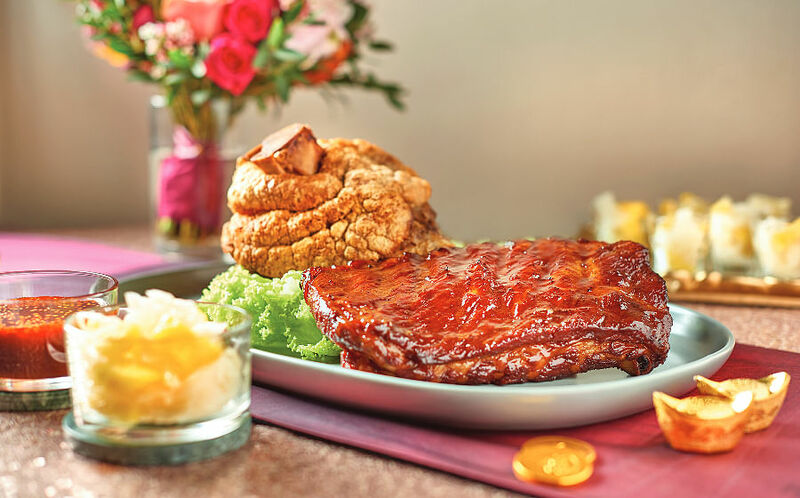 What’s better than a dish of slow-baked honey butter ribs? 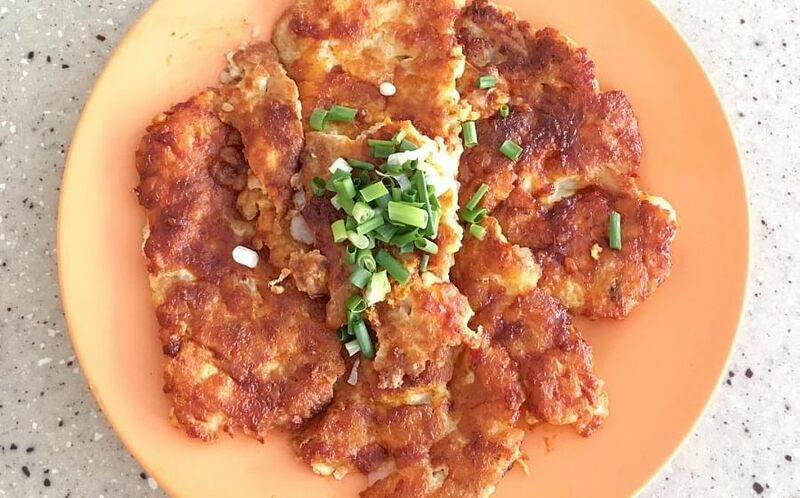 When it’s combined with deep-fried pork knuckle that’s been marinated with Sichuan peppercorn and salt, and then baked for four hours and deep fried. The former isn’t shabby either: it’s been slow-braised for 80 minutes and then coated in honey butter. $147.65 nett for six persons. 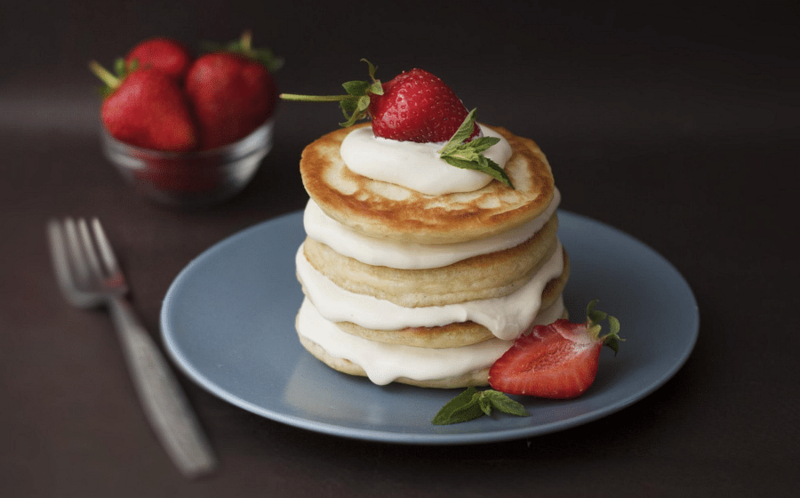 Alternatively, if you’re a stickler for the standard X-course set meals (hey, no judgement. It’s a sure-pleaser), Min Jiang has set meals that start at $118 (min.2 persons) and $888 (per table of 10 persons) for lunch and dinner. The Goodwood Park Hotel festive meal offerings are now available from today till 19th February 2019.